How much entertainment does fifteen dollars really buy? A two-hour movie runs for just about that price and the average CD is just under that figure. A consumer of those physical products knows exactly what they’re getting when they drop their money. The public, however, has been hesitant to spend money for something they cannot see. Digital downloads, while increasing in popularity, are usually offered at a lower price point to offset the notion that the consumer is buying a product they can’t actually touch. Castle Crashers may change that. 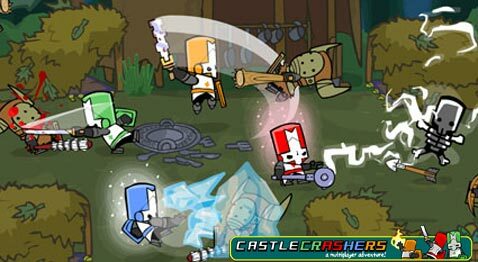 Castle Crashers is considered pricey for an xbox live downloadable title. Ten dollars was long considered both the average and the threshold of what gamers would pay for something that came without a box. With that price point in mind, many developers of downloadable content focused on simpler games, similar to the flash games available online for the PC. However, gamers for the most part are a particularly tech-savvy lot. The majority will pay for downloaded music from iTunes or other online vendors, comfortable in receiving nothing more than an electronic file rather than a packaged cd. Beyond the price, downloadable games aren’t much different from their physical cousins – a file that resides on the hard drive of a gamer’s xbox can suffer due to the same frailties as anything else stored in that manner (hard drive crashes, lack of portability, etc.). That said, Castle Crashers is worth every penny. The game is decidedly old school, a 2D, side scrolling, beat-em-up like one that might have been popular in the late 80’s. In fact, the game acknowledges this and plays to the genre’s strengths. The story is as old as videogames themselves. You play as a nameless knight who is attempting to rescue several abducted princesses in an attempt to defeat an evil sorcerer. Thankfully the gameplay is more exciting than the plot. Developers, The Behemoth, have captured everything that was ever exciting about this type of game, borrowing extensively from the past, shoehorning it into this project. The result is a dense, feature rich, addictive and highly replayable experience that invokes memories of the quarter-robbing arcade games of years past. The game supports up to 4 players. From the start, players can select from 4 characters and unlock more as they advance. Characters can also level-up by gaining experience, improve their character’s stats, change their weapons, perform and level-up magical attacks and acquire animal companions who help in a variety of ways. Levels are replayable and the game actually encourages this by hiding treasures and weapons that can only be discovered on subsequent passes. Aside from the play elements, the game feels like a button-masher from a different time, and good gawd is it ever fun. Seemingly to compliment the old school nature of the gameplay, the art style is decidedly un-modern and cartoony, the exact opposite of many boxed titles but the aesthetic works in this context. The music, surprisingly rich and moving, is the only indication that this product was made in the past year. I eagerly await a soundtrack release. The game refuses to take itself seriously and piles on the crude humour, which, surprisingly, only adds to its charm. Castle Crashers ravenously eats away at free time, blunts the fingers and may become the leading cause of repetitive stress disorders in adults. It begs to be replayed with countless unlockable characters, new weapons and hidden bonus content. All for the low, low price of fifteen dollars. Outside of the Dark Knight in IMAX, there is no better value. Previous Post Previous post:ohthree’s Take: Will There Be A Bright Future For The Dark Knight?